The black-box simulator for a (deterministic) takes as input a mode label, an initial state , and a finite sequence of time points , and returns a sequence of states as the simulation trajectory of the system in the given mode starting from at the time points . We provide several example simulation functions and you have to write your own if you want to verify systems that use other black-boxes. Once you create the TC_Simulate function and corresponding input file, you can run DryVR to check the safety of your system. To connect DryVR with your own black-box simulator, please refer to section Advanced Tricks: Verify your own black-box system for more details. A transition graph is a labeled, directed graph as shown on the right. 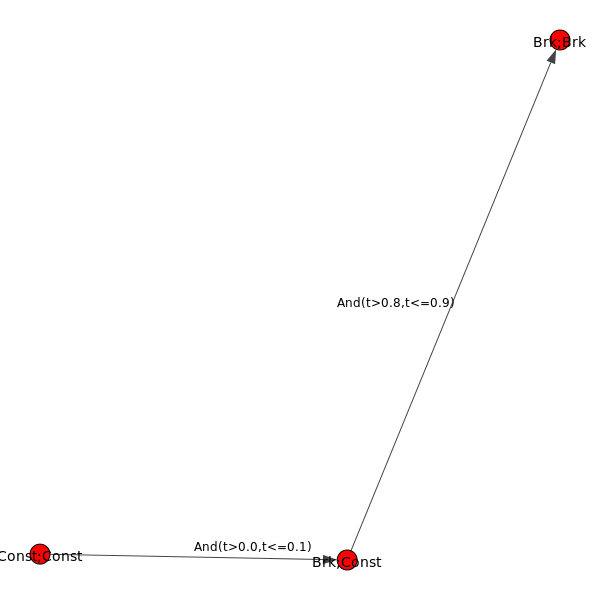 The vertex labels (red nodes in the graph) specify the modes of the system, and the edge labels specify the guard and reset from the predecessor node to the successor node. The transition graph shown on the right defines an automatic emergency braking system. Car1 is driving ahead of Car2 on a straight lane. Initially, both car1 and car2 are in the constant speed mode (Const;Const). Within a short amount of time ([0,0.1]s) Car1 transits into brake mode while Car2 remains in the cruise mode (Brk;Const). After [0.8,0.9]s, Car2 will react by braking as well so both cars are in the brake mode (Brk;Brk). "bloatingMethod": specify the bloating method, which can be either "PW" or "GLOBAL" # This is optional, if you don't have this field in input file, DryVR will use GLOBAL as default bloating method. "kvalue": specify the k-value that used by piecewise bloating method # This field must be specified if you choose the bloatingMethod to "PW"
Some fields are optional in DryVR’s input langauge such as resets, initialVertex, bloatingMethod and kvalue under some conditions. Please read the comment. The tool will print background information like the current mode, transition time, initial set and discrepancy function information on the run. The final result about safe/unsafe will be printed at the bottom. If the simulation result is not safe from the initial simulations, the unsafe simulation trajectory will be stored in “output/Traj.txt”. If the verfication result is not safe from the verification process, the counter example reachtube will be stored in “output/unsafeTube.txt”. We use a very simple example of a thermostat as the starting point to show how to use DryVR to verify your own black-box system. As for DryVR, of course, all the information about dynamics is hidden. Instead, you need to provide the simulator function TC_Simulate as discussed in Black-box Simulator. Step 1: Create a folder in the DryVR root directory for your new model and enter it. Step 2: Inside your model folder, create a python script for your model. Step 3: Write the TC_Simulate function in the python file Thermostats_ODE.py. Mode (string) -- a string indicates the model you want to simulate. Ex. "On"
initialCondition (list of float) -- a list contains the initial condition. Ex. "[32.0]"
Trace (list of list of float) -- a list of lists contain the trace from a simulation. Each index represents the simulation for certain time step.Represents as [time, v1, v2, ........]. Step 4: Inside your model folder, create a Python initiate script. Inside your initiate script, import file with function TC_Simulate. Step 5: Go to inputFile folder and create an input file for your new model using the format discussed in Input Format. Create a transition graph specifying the mode transitions. For example, we want the temperature to start within the range in the “On” mode. After second, it transits to the “Off” mode, and transits back to the “On” mode after another seconds. For bounded time , we want to check whether the temperature is above . Save the input file in the folder input/daginput and name it as input_thermo.json.